"They sing the old ballads better than anyone – anyone whom I know – and I know every folk-singer in Britain. Their voices, thank God, are untrained, soft, true and exquisitely sweet. And always clearly, and without the slightest sense of strain, you can hear every word which each of them sings – the first essential of a folk-singer. They are completely unaffected and unspoiled. On stage they give the illusion of perfect spontaneity. And to cap everything they are – believe it or not – ludicrously lovely!" It seems fitting to begin the Archive page with an old photograph of my grandmother, Dorothy, and her two sisters, Orisca and Rosalind – who were known as The Fuller Sisters. 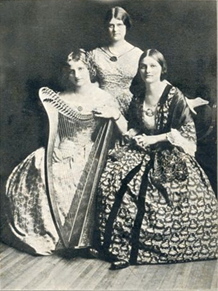 When Orisca got married, Cynthia Fuller (not pictured) replaced her and took over the harp playing role. The Fuller Sisters were English girls (from Dorset) who sang English, Scottish and Irish folk songs – performing in Victorian costume. They carried out six tours of America between 1912 and 1917, playing throughout the Eastern and Midwestern United States – managed by my great uncle, Walter Fuller, who was based in New York City at the time. (Walter married Crystal Eastman – a feminism activist and sister of Max Eastman, author and activist). My first folk influence was my grandmother, Dorothy Fuller – one of the Fuller Sisters (pictured above) – so perhaps I'll begin my stroll down 'Folk Memory Lane' in 1955, with the sound of her voice floating up from the garden of the flat in Harbord, Sydney, where she and her husband Jack lived, having recently emigrated from England. I can remember sitting on the back step, listening to her sing while she picked flowers and smiled at the birds – her beautiful voice carrying the simple, haunting folk songs to me – grandmother to grandson – she never gave me a finer gift. I was seven years old when I received that baptism of melody. I was already familiar with classical music – having been given a record player for my first birthday by a generous friend of the family who had been bemused by my fascination with my parent's classical records. But the traditional melodies that my grandmother sang were stronger than those found in classical music. They were so honest in their simplicity, so unpretentious in their structure that they connected on a more purely emotional level in a way that classical music – due to it's complexity – can rarely do. Not that I thought about it in those terms, as a child, of course – I just knew that the songs my grandmother sang, did something to me! However, my parents encouraged me to play classical piano – which I enjoyed – and although our Sydney home was often filled with classical musicians, laughter and candlelight, my childhood passed without much more exposure to folk music. Dorothy was older now, and I don't recall her singing very much once her voice became frail – she just faded like a sunset... a beautiful one. In 1961, I was thirteen and beginning to bumble my way through high school. I always struggled academically – due to my dislexia – but singing in the school choir in St Andrews Cathedral, three mornings a week, made going to school worth it. How I loved the choir – gazing at the soft, shafted light that beamed through the stained glass windows as our boy-soprano voices soared through the cathedral. Now a teenager, I was totally hooked on the Top 40 Pop Charts on the radio, and made endless lists of Bullet Performers, the position that songs entered the charts and how long they remained at Number One if they made it that far. There was much more of a variety of music on the charts, back then, than there is today – even instrumentals were included. Occasionally, a folk song by the Weavers or Burl Ives would receive airplay, and although I was into Pop music, the seeds my grandmother planted in me as a child were about to flower. The Folk Revival was stirring and I was lucky enough to be a teenager at that magic time – the 1960s! The following year, in 1962, I attended my first big concert and had one of life's 'lightbulb' moments – although it was more like a lightning strike! I saw the American folk trio, Peter, Paul & Mary at Rushcutters Bay Stadium in Sydney. We had good seats, close to the stage. I was smitten by the trio's stunning harmonies, fingerpicking guitar... and by Mary Travers – her wide, sensuous mouth and long platinum hair that flashed in the stage lights as she tossed her head from side to side, stirred new feelings for a boy in the shadowland. That was also the year I walked into the living-room and one of my mother's classical guitar records was playing – it was Andre Segovia. I was spellbound. That moment, and the Peter, Paul & Mary concert began my life-long love affair with the guitar. I gradually gave up the piano as I listened more and more to the guitar instrumental breaks in songs on the Top 40 – and the voices of the sixties revolution! I left school in 1965 and I bought my first guitar – the instrument has been my constant companion ever since – and I can feel my grandmother smile every time I'm lucky enough to write a good melody!